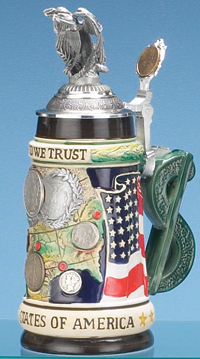 This top-grade, hand painted stoneware stein honors the best known U.S. coins minted. Their romantic, artistic and historical qualities appeal to all coin collectors. Six of these coins were minted within the same general period of history, when the U.S.. emerged from adolescence as the richest financial power of all time. The seventh coin is the Sacagawea Golden Dollar, the first dollar coin of the new Millennium, adorned with the year 2000 and serves as the thumblift.